By the time your baby is between 6 months and 1 year of age, you can expect to see their two front teeth coming in. This can be a very exciting time for you as a parent; soon you’ll be brushing your teeth alongside them in the bathroom, singing songs to make sure they brush for long enough. But teaching them oral care isn’t just about developing good habits. According to your dentist, baby teeth play a large role in your child’s oral development overall. With February being children’s dental health month, there’s no better time to protect your child from decay than now! When baby teeth come in, you’ll be able to introduce them to new, tougher foods they couldn’t eat before. This will make it easier to introduce food important to their future nutrition. Furthermore, baby teeth play a huge role in how their permanent teeth erupt once they fall out. Baby teeth are meant to hold space in your child’s mouth while their permanent teeth grow under their gums. If a baby tooth falls out too soon, the permanent teeth underneath will start drifting towards the empty space to compensate. This can cause their future teeth to come in crooked or crowded, costing you more money for treatment later and making it more difficult for them to eat, talk, and bite properly. The first visit to your dentist should occur after their first tooth erupts or no later than their first birthday. While there isn’t too much to observe, your dentist will want to confirm the health status of your child’s mouth and make sure there are no cavities or underlying problems. Additionally, you’ll get the chance to learn the best techniques for cleaning and brushing their mouth. Your family dentist may also cover oral habits your child currently has, fluoride needs, teething, and eventually schedule another check-up once more teeth erupt. Before any teeth come in, you’ll only need a wet washcloth or gauze pad to clean your child’s gums and mouth. Keep in mind that as soon as teeth appear, decay can appear as well. If your child is under 3 years of age, use a fluoridated toothpaste and toothbrush designed for toddlers for daily care. Use a smear of toothpaste no larger than a grain rice to prevent them from consuming too much accidentally. 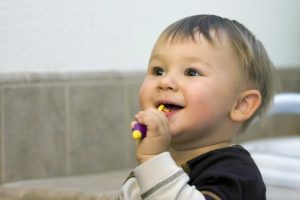 After a while, your child will become accustomed to brushing twice a day. Once they reach the ages of 3 to 6, let them use a pea-sized amount of toothpaste. Supervise them as they brush to confirm their technique is good. As more teeth erupt, you’ll be able to show them the importance of flossing as well. With help from your family dentist, taking care of your child’s baby teeth couldn’t be easier. For more tips on pediatric care, schedule your first dentist appointment for your child today! David W. Cleveland, DDS, earned his undergraduate degree from Duke University and his Doctor of Dental Surgery from Ohio State University. With three kids of his own, Dr. Cleveland understands the importance of developing good oral habits early. To learn more about his practice, contact him at (937) 644-8822 or visit his website.